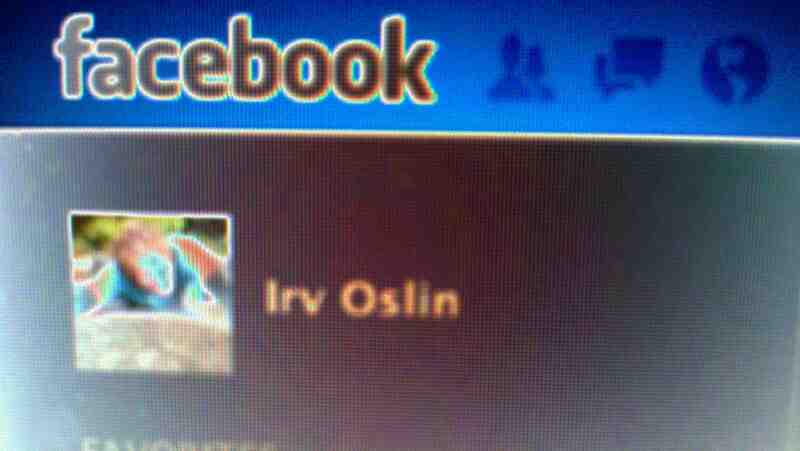 My name is Irv and I’m addicted to Facebook. I’ve suspected for sometime that I was hooked. On Christmas day about three or four years ago, I was home alone, lonely and bored. I opened a Facebook account and gradually got sucked in. It was obvious from the start what the attraction was. It’s the strokes you get from being “liked” and the warm fuzzy feeling of connecting with old friends, with the past. Yesterday I read a Newsweek article about how Facebook — and social networking in general — shrinks your brain and turns you into a social misfit. I was accomplishing that on my own, but I can’t help but feel that Facebook has accelerated the process. In recent months, instead of meditating first thing in the morning, I find myself “shooting up,” getting my morning Facebook fix. Throughout the day, I check in constantly. Looking for my strokes, massaging my dopamine receptors. I kid myself that I need Facebook to keep track of my family or to stay abreast of developments in the news biz. But it’s all about the strokes. Like me. Like my photo. Should I quit cold turkey? Or just try to wean myself? Maybe I can find a self-help group on Facebook. 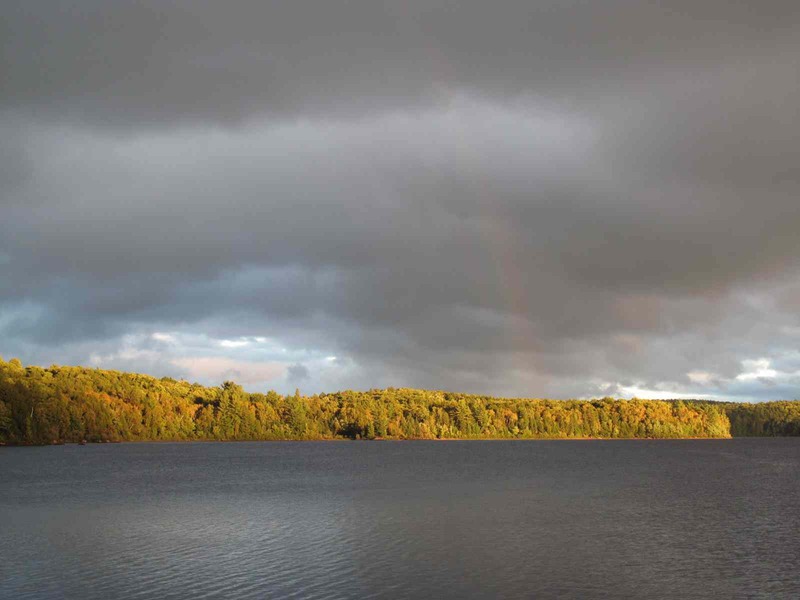 In the previous post, I talked about our daily excursions exploring the lakes of Algonquin Provincial Park. On that and other Agonquin Canoe Trip posts, I added an little embellishment here and there. Ken might say more than a little. It’s sad what getting old does to your memory. I’ll try to resist the temptation to embellish on this post, mainly because our excursions on the final days of our trip were remarkable unto themselves. We had returned to Penn Lake and set up base camp. On the last full day there, we ventured back up to Rock Lake, our port of entry, and went to visit a huge bluff with a breathtaking view. The beauty of it was, the climb to the top wasn’t breathtaking. Not even for someone just a tad over the hill. Instead of talking about the final days, I’ll post photos. Post Script: After reading this post, Ken called to say he forgot why he was calling. 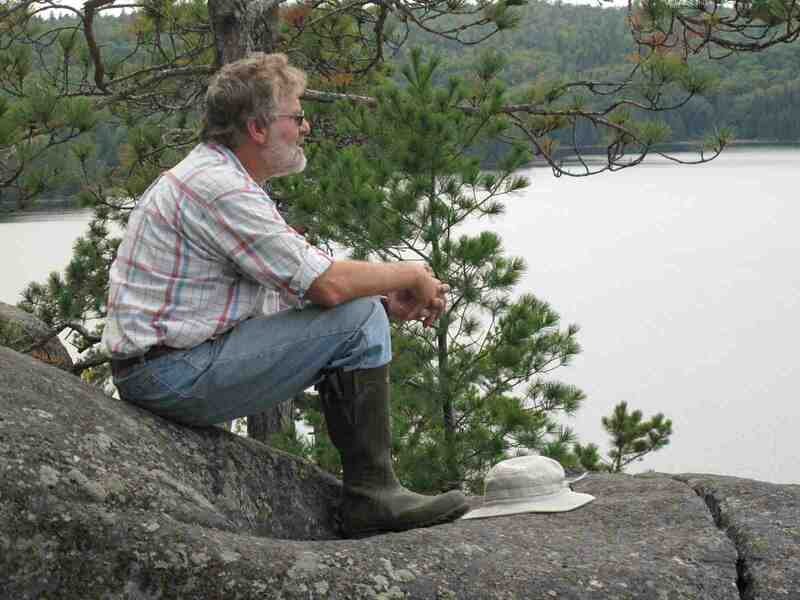 Ken enjoying the view from the bluff on Rock Lake. I wonder if he remembers this. Steve setting out for an evening paddle on our last day. Nice rainbow in the background. As mentioned in previous posts, Algonquin canoe camping differs in many ways from what I’ve done on Ohio streams for the past 32 years. The itinerary is one of main differences. On river trips, you put on at point A, drift or paddle for as many days as you can, and end up at point B. Or at point C, as we have done on occasion and had to hitch a ride back to our designated take-out at point B. 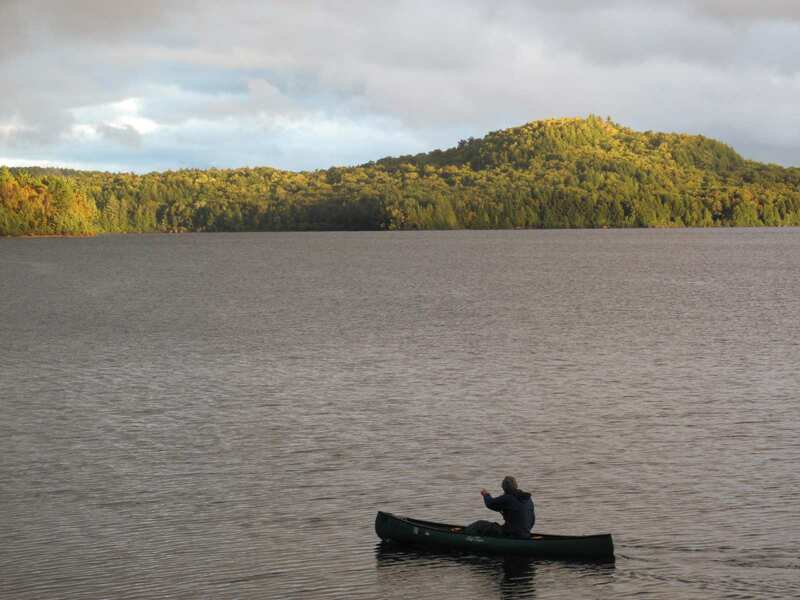 When you paddle Algonquin, you move from lake to lake to lake, as far as your time and ambition will take you. 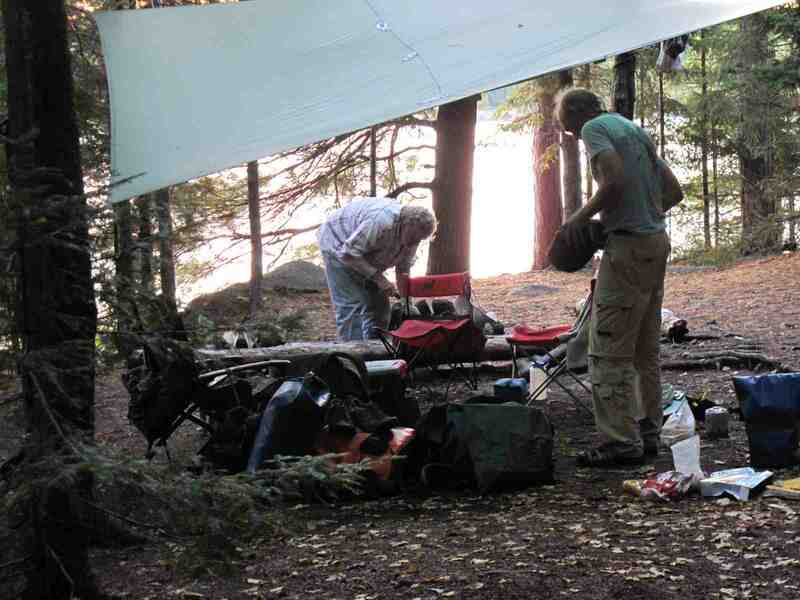 The way Steve and Ken do it is to spend several days on each lake, set up a base camp and explore the lake by day. Or, in Steve’s case, by night. That was one of the many mysteries of our Algonquin adventure. Steve would grab a canoe and slip off into the night, usually returning before dawn. Ken and I suspected he might have a campsite secreted away where he could get away from us and our snoring — where there were coolers full of steaks and fresh vegetables and probably a home entertainment center. But, Steve would always come back with tales of wild adventures, like antagonizing sleeping beavers so they’d come out of their lodges and splash him with their tails, or sneaking up on campsites in the darkness and using his ventriloquism talents to make one camper say something rude to a fellow camper. 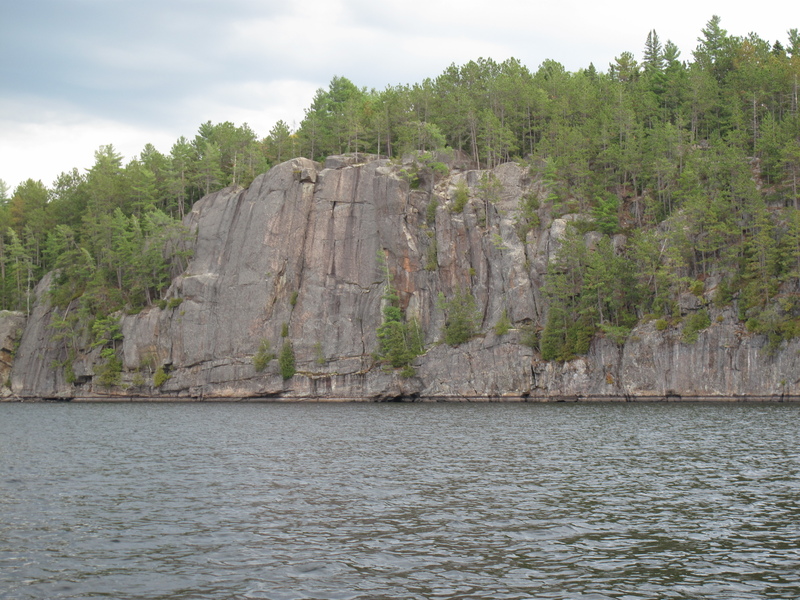 I really enjoyed the day trips, checking out islands and hiking nearly two kilometers to Little Canoe Lake, which has a 1,970-meter portage. Apparently a lot of people make the trip because the trail is well-worn. But I can’t see the point of hauling a canoe all that way to a lake that has no designated campsites. And besides, the lake is so small, you could spit to the shore from the middle of it. But it was a great hike. 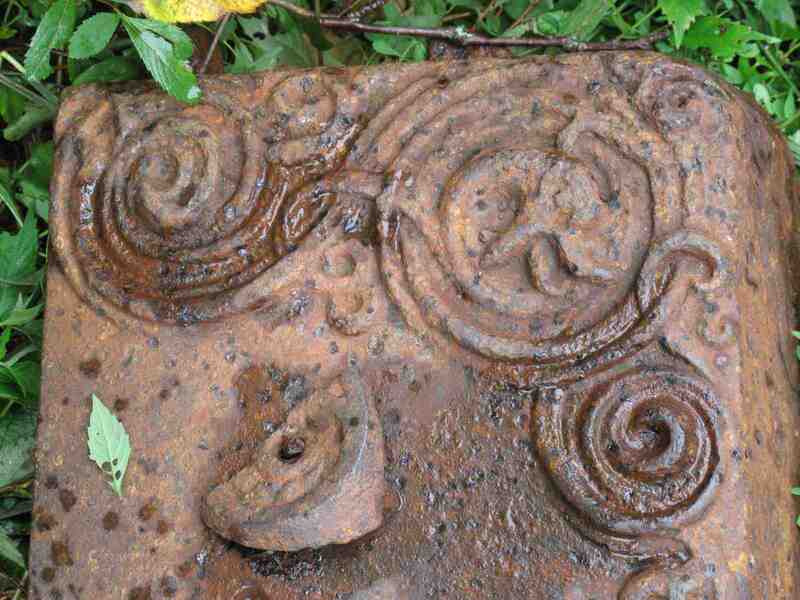 At the head of the portage trail, we found part of an old iron stove. 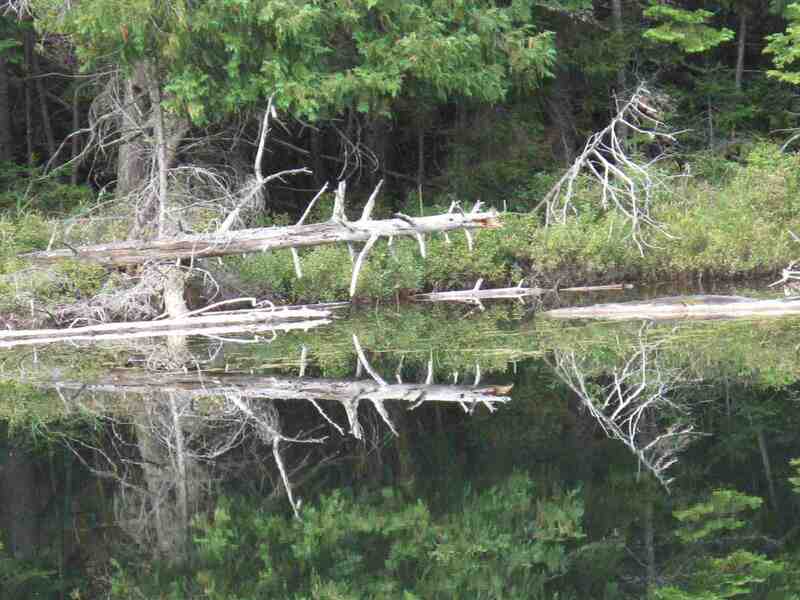 There were logging camps there and this probably was left behind after the trees were decimated and hockey was invented, which gave loggers something else to do. Halfway down the trail, we came upon a dirt road. Not wanting to be the first person ever to drive 570 miles to the Algonquin wilderness only to get run over by a bus, I sprinted across the road both times we crossed it. It was a great hike. We examined the flora and fauna along the way, Steve identifying the plants and crawling things and Ken contributing his knowledge. I also chimed in with my newly acquired knowledge of moose poop and they were kind enough to wait for me while I cleaned it off my hiking shoes. We paused for lunch at Little Canoe Lake. 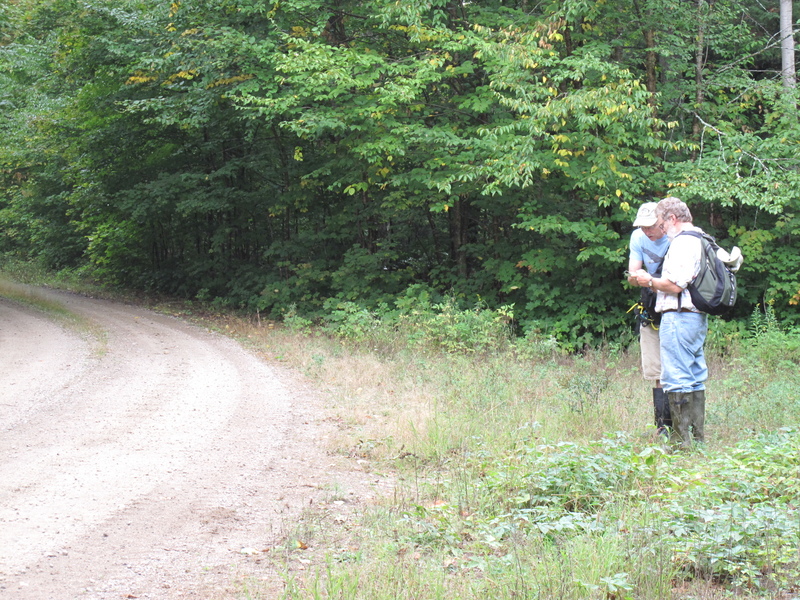 As we set out to return, a couple of young guys from Toronto emerged from the woods. They had arrived after we did and made their way to the lake. 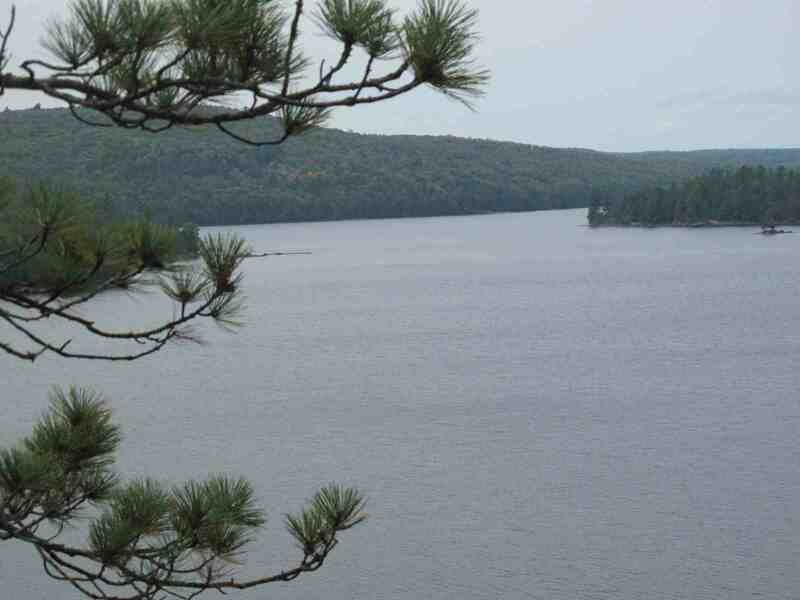 Little Canoe Lake. If I were 20 years younger, I could have jumped across it. Or tossed one of those upstarts from Toronto halfway across. I think they found us stranger than any of the flora and fauna they encountered on their hike. We exchanged pleasantries. Except one of them insulted me by saying that, when he saw Steve and Ken’s sleek kevlar tandem canoe next to my Old Town Pack solo boat, he assumed that whoever had the tandem boat had brought along the Old Town for their dog. We parted company. As we got nearly out of sight of our Toronto friends, I lifted my leg and peed on a tree to register my displeasure. 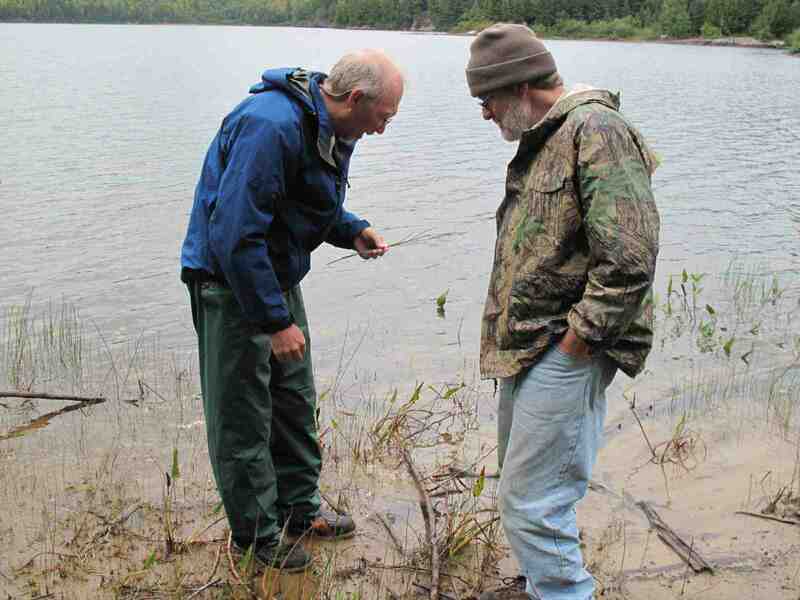 Steve, left, sorting out and identifying the flora on Penn Lake. Early in the trip I mentioned to Ken that I once went canoe camping in Ohio with an improvisational comedy troupe. We knew just about every joke there was, so we’d sit around the campfire telling punchlines. There was plenty of humor on our trip, almost as much as there was rain. After we got tired of sitting around the campfire calling out numbers and laughing at the good ones, we started making up jokes of our own. 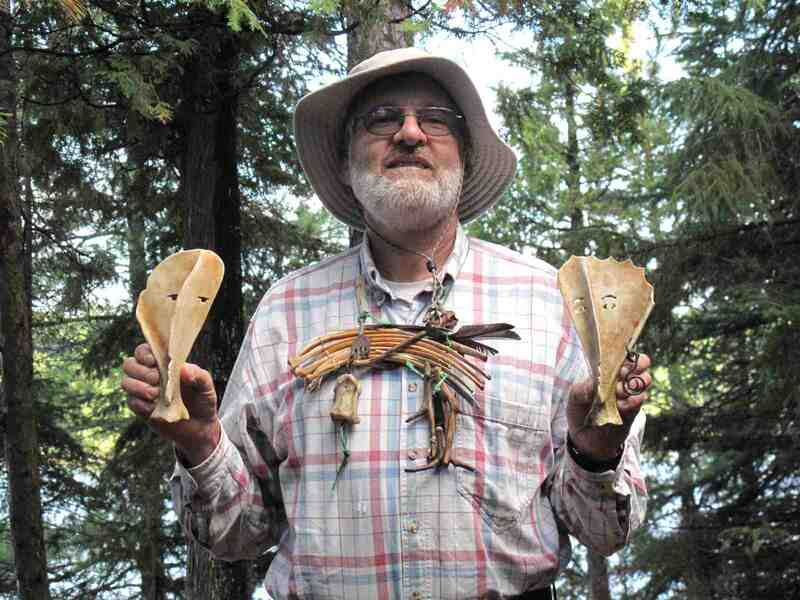 Since Ken had gone through the trouble of making a pair of puppets out of moose scapulae, I thought I’d make myself useful and write a little script for them. Be advised that it contains a lot of inside jokes from the canoe trip so you might not get all the references. If not, just assign them a number and ask me about them later. In the big ending, Dog created the heavens and the earth. On the first day, He rested because He was dyslexic and did everything bass ackwards, which you can say on the radio. On the second day, He created man. Realizing His mistake, He immediately improved upon his design and created woman. Man suggested to Dog that, since there are seven wandering bodies in the heavens, why not have seven days in the a week? Dog became frustrated with man’s ignorance because anyone could plainly see that, including the Earth, there were eight wandering bodies in the heavens. In the remaining five days of the week — or six, depending on who you believe — Dog created the flora and the beasts of the field. Then he created Steve to sort them all out and figure out what they were. And He saw that it was good, but not good enough. So he created Ken to improve upon it. Ken: (To Clyde and Gale) And that, my little friends, is how you were created. Clyde: How do you know all this? Ken: Because Irv wrote it all down in his journal, and he’s a journalist. Clyde: And you believe him? Gale: Yeah, those guys never get anything right. Ken: I’ll have you know that Irv spent 14 years studying at Cuyahoga Community College. I’m not saying it rained a lot during our week at Algonquin. But, when we arrived on Labor Day, lake levels were more than two feet below normal. When we left the following Sunday, the only way to travel in most of central Ontario was by canoe. Our equipment was equal to the task. Except for the tenting equivalent of a “wardrobe malfunction” that left Ken with a soaked sleeping bag one night. The nylon tarp I brought served us well. Except for the night the bungee on what was supposed to be the low corner crept up the tree and the tarp filled with water overnight. My $200 rain jacket also proved adequate. Except when I forgot to zip up the pockets and ended up with a lapful of cold water during a paddle across Penn Lake. We spent many an hour under the tarp watching the rain fall and debris float by, occasionally moving our chairs when a larger branch came floating through. The upside of all that rain was it made washing dishes easier. Instead of washing them in the lake, all we had to do was place Steve’s big pot beneath the low corner of the tarp and fill it with dishes. 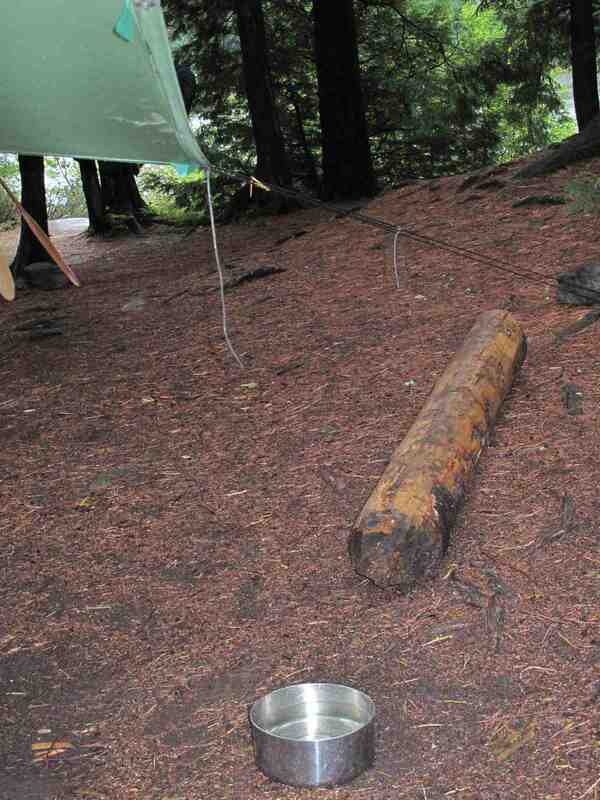 The rainwater running off the tarp agitated the water enough to clean the dishes within a couple of hours. We made the most of it though, sitting around and singing “Camp Granada” and making up new verses. I always thought canoe trips were sort of like space travel; you’re cut off from the world, journeying to parts unknown and dependent on specially prepared food to survive. Unlike space travel, there is gravity so you don’t have to eat breakfast, lunch and supper out of a tube. Unless you run out of food and have to eat your toothpaste. Getting ready to make supper at Clydegale Lake. I handled breakfasts, Ken did lunches and Steve made supper. What’ll it be tonight boys? Powdered spaghetti? Powdered potatoes? Powdered powder? But you do have to pack light. Unless you’re Ken. He insisted on bringing along fresh fruit, which he didn’t tell me until after I volunteered to combine our food into my plastic tote. So I meticulously packed my six days worth of dehydrated breakfasts to leave plenty of room for Ken’s lunches, which included apples, baby carrot slices and a watermelon. All right, I’m exaggerating; it was a pineapple. But seriously. Gathering food for the Algonquin trip was a learning experience. 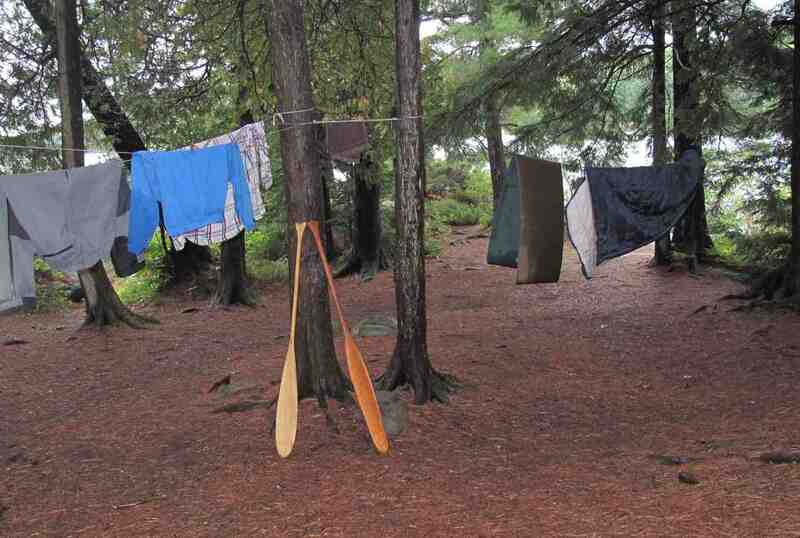 Prior to this trip, my concept of canoe camping was more in tune with the pre-railroad era. To me, canoes were more like canal boats, capable of bearing tremendous loads. I considered the 740-pound load limit sticker posted on the bullkhead a starting point. Reconstituting dehydrated food is an adventure in itself. Especially for the mathematically challenged. On day one, I didn’t put enough water in the powdered eggs. What was supposed to be a Denver veggie omelette was more like egg jerky with subtle undertones of dry pancake batter. The second day, I added too much water to the rehydrating packet. After we drank our breakfast, we headed out for a day of exploring Clydegale Lake, comforted by the fact that I wouldn’t be responsible for lunch too.